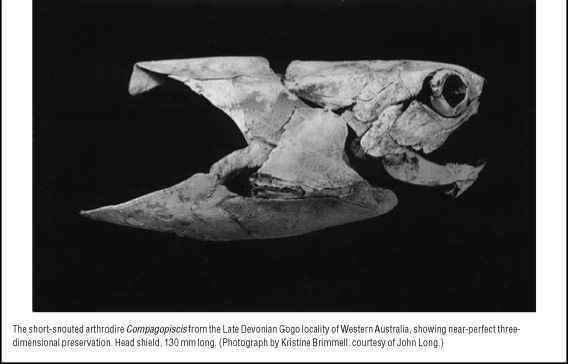 The Gogo locality in Western Australia, of Late Devonian age, has produced some of the most spectacular fossil fishes in the world, including 20 species of arthrodires. The specimens are preserved uncrushed and in three dimensions. Fossils were first collected on the lands of the Gogo cattle station in the 1940s, but their true quality was not realized at first, because a great deal of detail was lost when they were cleaned using chisels and needles. It was only in the 1960s, when palaeontologists prepared the fossil-bearing carbonate nodules using dilute acetic acid, that the astonishing quality of preservation became apparent (see photograph). Further expeditions in the 1980s and 1990s have greatly increased the collections of spectacular Gogo fossils (Long, 1988, 1995). Some of the Gogo arthrodires belong to groups that were already familiar from other parts of the world, but many of them are quite extraordinary and new to science. Several, such as Fallacosteus, belong to a new family, the Camuropiscidae, small 0.3 m long fast-swimming shark-like predators. 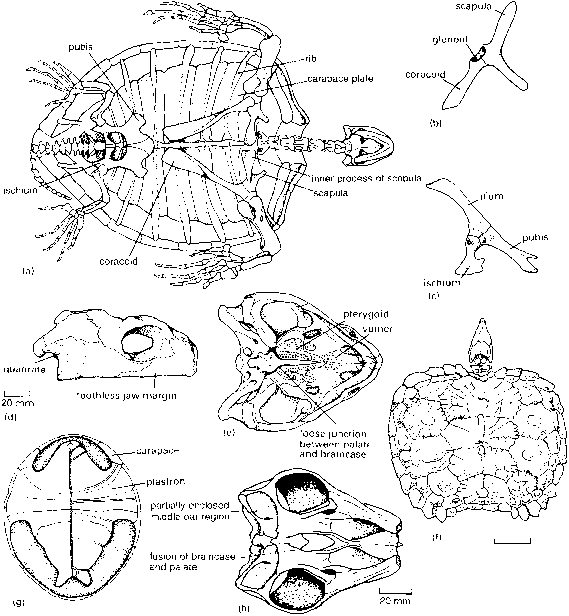 The camuropiscids have pointed bony projections at the front of their snouts, giving the head shield a torpedo-like shape. The eyes are large, and the tooth plates are designed for crushing. They may have hunted the fast-moving shrimps that teemed in the tropical Gogo waters. The plourdosteids, like Compagopiscis (see photograph), were short-snouted relatives. The jaws open (Figure 3.13(d)) by an upwards swing of the skull and dropping of the lower jaw (Miles, 1969). The skull hinges about the ball and socket joints within the lateral margins of the dorsal part of the head shield, and the size of the gape is limited by the width of the nuchal gap. It has been suggested that placoderms used a head-lifting form of jaw opening in feeding on the bottom of the sea and lakes. It would have been easier to capture prey by driving the lower jaw forwards in the bottom mud and lifting the head, than by attempting to drop the lower jaw. Later arthrodires have even more reduced armour than Coccosteus, often only a very limited trunk shield. Two Late Devonian families, the Dinichthyidae and the Titanichthyidae of North America and northern Africa, achieved giant size, as much as 6-7 m in length. Dunkleosteus (Figure 3.13(e)) was the largest predator in Devonian seas, and the largest vertebrate yet to evolve. With its vast jaws it could have crushed any other animal of its day. 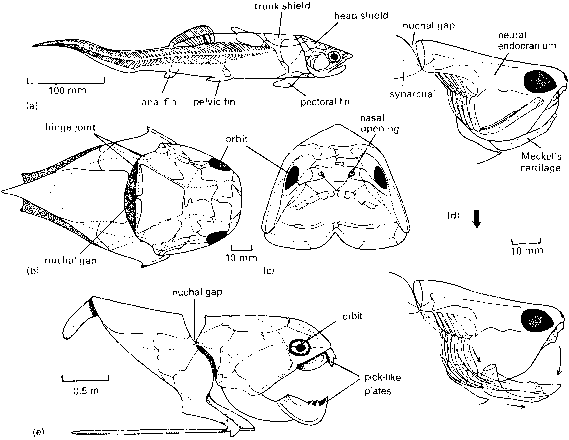 The acanthothoracids, the basal placoderms, have a head shield rather like that of some early arthrodires. The plates were separate in juveniles, but appear to have fused in the adults. The rhenanids have a body covering of small tesserae instead of the more typical large plates. Gemuendina from the Lower Devonian of Germany (Figure 3.14(a)) looks superficially like a ray with its very flattened body, broad pectoral fins, and narrow whip-like tail, and it may have swum by wave-like undulations of the pectoral fins. There are large bone plates in the midline, around the eyes, nostrils and mouth, and on the sides of the head, which are divided by a mosaic of small plates that extends on to the trunk and pectoral fins. The antiarchs were a diverse group from the Mid- and Late Devonian that retained a heavy armour covering, and specialized in a bottom-dwelling mode of life, feeding by swallowing mud and extracting organic matter. Pterichthyodes, an early form (Figure 3.14(b)), has a high domed trunk shield made from a small number of large plates. The pectoral fin is entirely enclosed in bone, and it was movable against the trunk shield by a complex joint. There is also a second joint about halfway along the fin. This fin was probably of little use in swimming, and it may have served to shovel sand over the back of the animal so that it could bury itself. The most successful placoderm of all was the an-tiarch Bothriolepis (Figure 3.14(c)), known from more than 100 species found in Middle and Upper Devonian rocks of all parts of the world. Bothriolepis is a slender placoderm, with a lightly-scaled tail region, bearing paired pelvic fins. The pectoral fins are slender and covered with armour plates, some of them with jagged tooth-like edges. One specimen shows possible evidence for lungs preserved inside the dermal armour. Bothriolepis probably grubbed in the mud for organic detritus, and it may have been able to survive in stagnant ponds by breathing air. The petalichthyids are another small group of bottom-dwelling forms. Lunaspis from the Lower Devonian of Europe (Figure 3.14(d)) is flattened, with a short trunk shield and long cornual plates. The anterior part of the head shield, around the eyes and nostrils, is covered by numerous tiny scales, as is the long trunk. Ptyctodonts have reduced armour plating. They are generally small, usually less than 200 mm in length, with long whip-like tails, a long posterior dorsal fin, and a high anterior dorsal fin supported by a spine on the trunk shield. Ctenurella from the Upper Devonian of Australia and elsewhere (Figure 3.14(e)) has much reduced armour. Some ptyctodonts have claspers, elongate elements associated with the pelvic fins that are assumed to have been involved with the process of internal fertilization. Claspers are seen in male chondrichthyans, but the structure of the ptyctodont clasper is different from that of a shark.